Keynote lectures: Adrian Favell (University of Leeds) and Sarah Fine (King’s College London). The deadline for submissions is 15 October 2015. IMISCOE and Princeton University are proud to announce the first transatlantic IMISCOE PhD Summer school. The PhD Summer school will take place between 7 - 13 of August 2016 in Princeton on campus. New Immigration and the Redefinition of the Mainstream: Transatlantic Perspectives. IMISCOE has opened nominations for its 2016 Maria Ioannis Baganha Dissertation Award. The Network has awarded this prize annually since 2010 to stimulate and recognise excellent PhD research in the field of migration, integration and social cohesion in Europe. This annual prize is awarded to what the IMISCOE Award Committee deems the best dissertation in the field of migration, integration and social cohesion in Europe. Applications should be submitted by email to Cees Jochemsen by 4 January 2016. 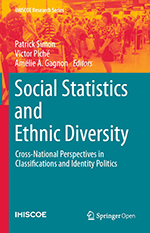 "Social Statistics and Ethnic Diversity - Cross-National Perspectives in Classifications and Identity Politics" - Edited by Patrick Simon, Victor Piché, and Amélie A. Gagnon is now also to be found in our own digital library. "Toward an improved understanding of immigrant adaptation and transnational engagement: the case of Cuban Émigrés in the United States"
"A national turn of local integration policy: multi-level governance dynamics in Denmark and Sweden"
"Full membership or equal rights? The link between naturalisation and integration policies for immigrants in 29 European states"